Biscotti Babe Wig by BelleTress can be worn as an asymmetrical bob that is wavy or styled as an A-line. Textured bobs are chic, cool, and extremely stylish especially when paired with a dramatic neckline. 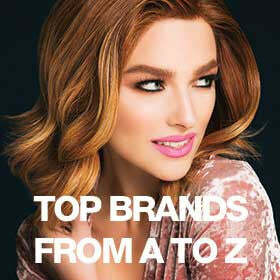 Emphasize this tousled look by contrasting simple and clean makeup. Sides: 10-13” | Nape: 5-6" | Back: 12-13"
Making the Braid: how a little messy can make you look neat! Do Lace Front Wigs Damage Your Hair? Wigs for Kids | Hairdo Launches KIDZ Wigs Line!